Born in Guilford County, North Carolina, John Bundy’s family moved to a farm near Monrovia, Indiana in 1893. As a young man attending a Quaker school, he was encouraged in art by celebrated Hoosier poet James Whitcomb Riley who had become aware of his drawings. Riley gave Bundy a number of art books to study the work of well-known painters. Bundy’s early work was that of portraiture, a more lucrative form of art. 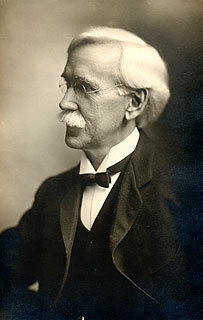 In 1888, Bundy became the head of the Earlham College Art Department. For eight years he taught drawing and painting before leaving to pursue painting full-time. He would become Richmond’s premiere artist and dean of the Richmond Group. His dealer, J.W. Young of Chicago held regular exhibitions of his work. He would exhibit his works at the Pennsylvania Academy of the Fine Arts, the National Academy of Design and the National Arts Club in New York. In 1910, he showed in the Biennial Exhibition at the Corcoran Gallery of Art in Washington, D.C. He also would show on an annual basis in Indiana, including the Richmond’s Annual Exhibition. Bundy was one of the founders of the Art Association of Richmond. He was in attendance at the first organizational meeting and served on the board of directors for many years. 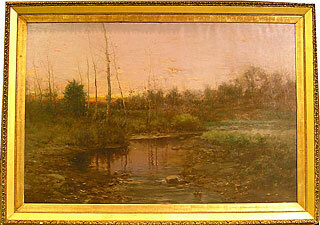 The Art Association purchased his five-foot long painting, Blue Spring in 1900. This was only the second work the art association had acquired, the first being Near Metamora, In the Whitewater Valley, 1899 by T.C. Steele, reflecting the importance of Bundy as an Indiana artist. Throughout his career, Bundy was devoted to the woodland interior. He has immortalized the beech woods of his home state. Bundy noted: “I was first attracted to the beech because it is so numerous here in Indiana. I think the beech right here in Wayne County is the finest I have seen anywhere. I like the woodland and, of course, I could not paint a woodland without painting the beech”. Although many of his paintings seem to be of autumn, he did paint all seasons, including a large number of winter scenes on permanent view at the Richmond Art Museum. Much of the fine quality of art in Richmond can be attributed to the influence of John Bundy. As a teacher, painter, mentor, and art patron, he has given much to his beloved community. He left sixteen paintings to the Richmond Community School System as inspiration to young children. His love of nature of the surrounding community is evident in all of his work. His legacy continues by his work being represented in many our local institutions including Morrisson-Reeves, Richmond Community Schools, Earlham College, Indiana University East and local banks and businesses. Fedders, Kristin U. Poetic Woodlands;The Art of John Elwood Bundy; Richmond, Indiana, Richmond Art Museum, 2002. Gerdts, William H. A Walk in the Woods: The Art of John Elwood Bundy; Indianapolis, Indiana; Eckert Fine Art Galleries, 2000. Johnston, Ella Bond. The Art Movement in Richmond, Indian: A History. 1937. The Richmond Palladium, January 18, 1933. Death Claims Leading Figure in Art World.